An interesting monthly publication put out by the BLS is the Monthly Labor Review. 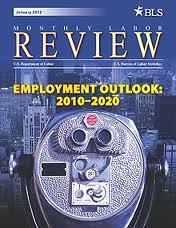 The January edition included an Overview of projections to 2020 based on its Employment Outlook 2010-2020. The overview contains a review of the underlying data behind all of the BLS’s projections. Labor force participation by demographic, the connection between GDP and productivity, job growth by sector/industry, job growth by occupation, job growth by education level – all are included in this overview. What I found most interesting was a graph and brief discussion comparing the most recent recession and the resulting time to labor market recovery to the previous four recessions. Take a look at the graph. We all know that the effects of the 2007-2009 recession are still being felt. In fact, the graph shows that we are a long way from reaching “recovery to level at start of recession” — some 30 months out from the official end of the recession. No surprise, but perhaps the combination of the length of the recovery together with the continued gap between where we are and the “recovery to level at start of recession” is noteworthy. Also of note: this overview reports that the BLS sets the “natural rate of unemployment” at 5.2%. We’re still a long way from the recovery to level at start of recession rate — and a much longer way from the natural rate some 40 months from the official start of the recession. The real question is, why is this recovery taking so long compared to the previous recoveries shown in the graph? Labor market analysts discuss the cyclical vs. structural causes that continue to depress hiring and job creation. Cyclical unemployment occurs when workers are laid off because of weak demand, but who expect to be re-hired when demand picks up – usually by the same organization, and usually in the same occupation or industry. Structural changes in the economy also create job loss – our most recent recession proved that unequivocally. Structural unemployment could also be caused by weak demand, but is fundamentally caused by other dynamics that impede workers’ abilities to return to work when demand picks up. For example, new technology and resulting productivity gains may reduce the need to rehire workers with less current skills and may reduce the number of workers needed even after recovery. As time goes on, the skills deficit of the structurally unemployed gets bigger and so they may well experience longer periods of unemployment. Retraining in new occupations will be required for these workers in many cases. Sound familiar? As HR and talent management professionals take into account the impact of both cyclical and structural unemployment in their locations and industries, their approach to creating a robust talent pipeline will be far more realistic and attainable if they focus on causes of structural unemployment. Just as employers are having difficulty finding the skills they need, the structurally unemployed are having difficulty finding new homes for their outdated skills. Surely the answer is obvious to more than me.